Lesser celandine (Ranunculus ficaria) is an invasive forest plant that been found in urban forests in southeastern Wisconsin. The plant has a history of taking over forest floors in the eastern U. S. and crowding out native plants and tree seedlings. 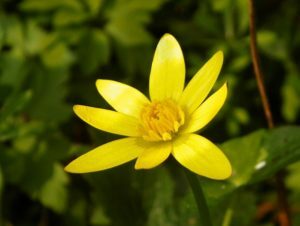 Consequently, lesser celandine is listed as a Prohibited Species under the state’s invasive species law NR 40, and cannot be transported, sold, introduced or possessed in Wisconsin. DNR is undertaking control projects in Dane, Milwaukee, Racine and Kenosha counties – four of the six counties where lesser celandine is known to occur – and will be conducting surveys in the remaining two counties, Walworth and Waukesha, to inform future control efforts. Lesser celandine starts growing in early spring, with bright yellow flowers appearing in April. It dies back by the end of June. This low-growing plant has shiny, waxy leaves that are kidney or heart-shaped. Small spherical bulbils that form along the stems drop off to give rise to new plants, while underground tubers sustain the plant after it dies back. Because of its short growing season, DNR depends on reports from the public to identify new populations to plan accordingly. If you encounter this plant, please report it at Invasive.Species@wi.gov. Amur cork tree is an emerging threat to Wisconsin forests. Lesser celandine is an emerging threat to Wisconsin forests – be on the lookout. Spherical bulbils of lesser celandine form during the spring growing season. Later they drop off and sprout to form new plants. 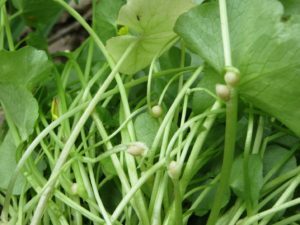 Lesser celandine (Ranunculus ficaria), also known as fig buttercup, is a ground layer plant and an aggressive invader of forests in North America. 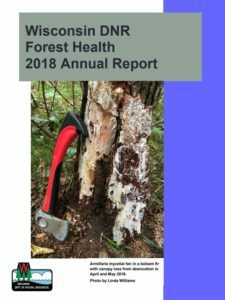 So far, it is relatively unknown in Wisconsin but has been found in the southeastern part of the state, especially in moist (mesic and wet-mesic) forests and along river banks. 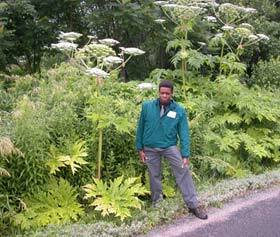 Financial assistance is available for controlling invasive species. Looking for a financial assist in your efforts to control invasive species? 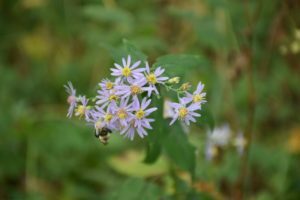 The Wisconsin Invasive Species Council website lists 61 different grant opportunities that are available from Federal and State agencies as well as private foundations. The list is searchable by applicant (tribe, government agency, company, non-profit, individual) and type of invasive organism (plant, animal, aquatic, invertebrate, disease). All but one has a link that takes you to more information or a contact person. Why not take a few moments to explore these opportunities? Written by: Michael Putnam, invasive plants program specialist, Madison (Michael.Putnam@wisconsin.gov), 608-266-7596.